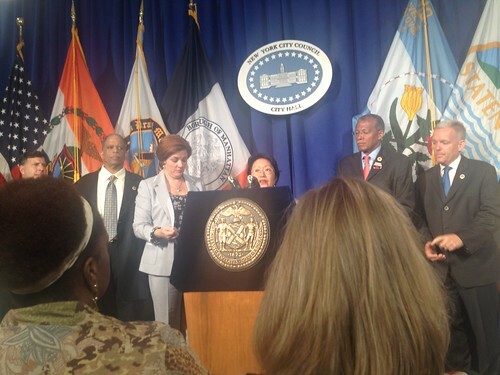 Sarah Darville Councilwoman Margaret Chin, behind the podium, spoke to the press about the compromises she had made with N.Y.U. before the Council’s vote. 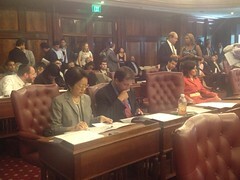 To her left is Speaker Christine Quinn and land use Committee chair Leroy Comrie. To her right is Councilman Robert Jackson. The City Council gave New York University a final green light to build four new buildings south of Washington Square Park, but opponents tossed out of City Hall today vowed to file a lawsuit against the controversial expansion plan. As The Local’s video shows, calls of “shame on you” and “corruption and greed” caused Speaker Christine Quinn to eject all of the spectators from the balcony, meaning university administrators weren’t around to see the City Council vote 44-1 in their favor. Still, Alicia Hurley, N.Y.U.’s Vice President of University Relations and Public Affairs, seemed to anticipate the outcome. “This is a terrific day for us,” she said as she awaited official word in front of City Hall. The expansion, dubbed N.Y.U. 2031, will add significant space for classrooms, dorms, and research — though not quite as much space as the university wanted. The plans were reduced by about 21 percent by the City Planning Commission and the City Council’s land use committee, though neither round of changes drastically altered the plan’s overall character. Today’s vote allows the university to build just under 1.9 million square feet across two blocks. Opponents of the expansion, including the Faculty Against the Sexton Plan and the Greenwich Village Society for Historic Preservation, did their best to keep N.Y.U. administrators from breathing a sigh of relief. As City Council members said their “ayes” (Brooklyn Councilman Charles Barron was the only one voting nay) the groups announced plans to file a lawsuit challenging the land-use review process. Sarah Darville Council Member Chin awaits the vote. The G.V.S.H.P.’s executive director Andrew Berman noted that his preservation group has never before gone to court, and said that the suit would focus on whether the public had adequate time to review the proposals. The review of the expansion’s environmental impact was also inadequate, he said. The person yelling most audibly through the Council chambers, a petite artist named Marianne Edwards, said years of construction would make her life miserable. She said her outburst was the only way to get anyone’s attention after a meeting with Council Member Chin yielded unsatisfying results. Ms. Hurley added that no construction was imminent, and that architects and designers would now turn to the logistics of making the now-approved “master plan” into a physical reality. Other changes to the public space on the superblocks will begin quickly, including a new seating area on Bleecker Street and the opening of Sasaki Garden to more pedestrian traffic.